I know this has nothing to do with Quanon's (awesome) pending addition to this mod, but I just started playing K1 with the initial release of this and MAN it looks good. I'm finding myself just staring at the skyboxes, totally distracted from my quests. The only skybox that doesn't really blend that well is Korriban's in the Valley of the Dark Lords, I'd say. How is that skybox not blending in well if I may ask? I personally think it's one of the best in that regard, so it'd be great if you could elaborate on that. That rock formation that isn't part of the skybox (so not your fault really) sticks out so much when you actually move in-game. The difference between the rock textures and the skybox is very jarring. In a screenshot you can't really tell, but once you get in-game and you are moving around with that part of the module on camera, it's a whole different story (at least to me). Once I get to do the next update for the skybox pack I'll have a look at it and see if there's anything I can do. But I fear it won't be possible unless I reduce the quality of the skybox as that's always an issue when only some textures are replaced with HD versions while others stay SD. Heh, the horrible low res nature of the foreground really stands out in that shot. Looking good though. You still using Terragen for these? And yes, I still use Terragen. But I upgraded from the free version of TG 3 to the full version of TG 4. The main advantages are in the fact that I now have the full version. The upgrade to version 4 might or might not be relevant to my renders. The full version allows me to actually render 2048x2048 textures instead of stitching together four upscaled 900x900 renders. Also I can increase the quality settings and use Global Illumination Caching which should get rid of unwanted lighting changes between renders (i.e. visible seams). And I can use more than three populations (randomly placed objects) which might be useful in some cases (like Taris). Out of curiosity, how useful would you consider switching from the current sky boxes to actual sky domes (in terms of level geometry)? Sky domes = half spheres? If so, then I'd say it would probably be an improvement but I'm not sure if it's actually worth the effort. The upside is of course that every point on the sky is then equally distant to the player (at least in the center of the dome) whereas skyboxes don't have that and thus have distortion. However that distortion is compensated for when rendering the skybox textures so it's not even visible unless you're actually close to the skybox (which you never are in the KotOR games). Not having that is the only real advantage of sky domes I see. The disadvantage would be that you have to put a flat texture on a spherical shape which is of course not possible without distortion so that might even negate the advantages skydomes have. But to be honest, I've never really thought about it. 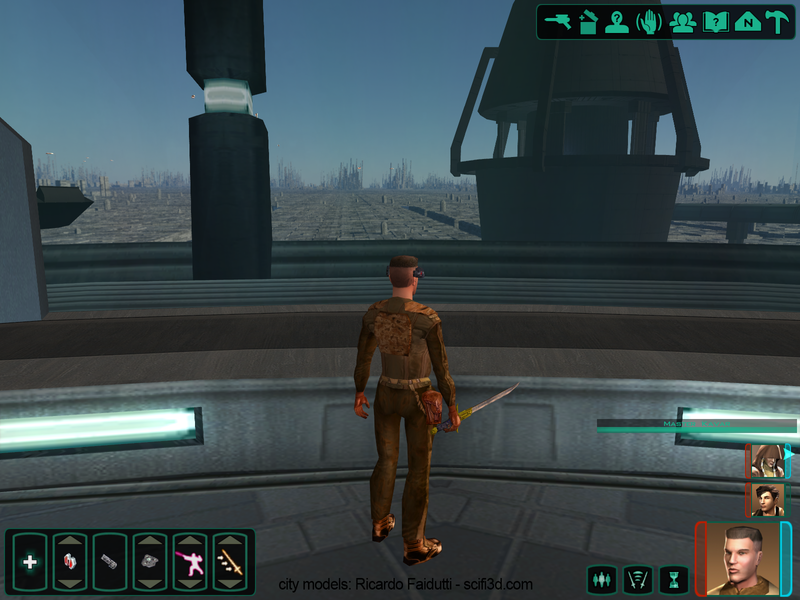 Skyboxes seemed fine for an old game like KotOR. Why do you ask? It was just something that floated across my mind. The sky boxes look pretty horrendous when you load them up in Max, but you're right that in-game they do a sufficient job and manage to hide the seams. But I thought there might be some edge cases, somewhere fairly open like Tatooine or Manaan. 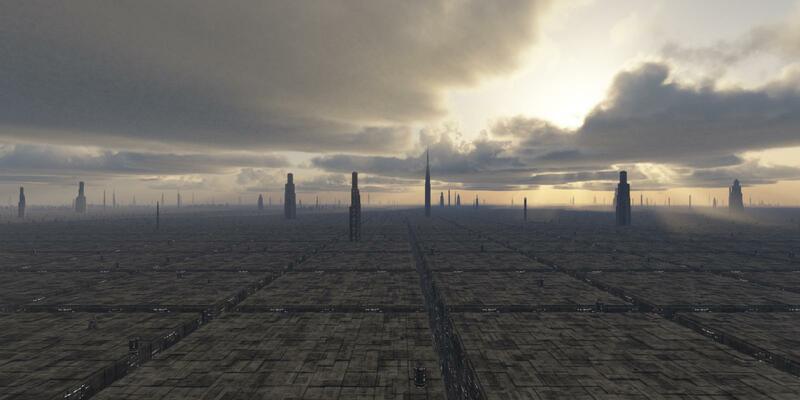 I used elements from a Coruscant scene I found on scifi3d.com and used them to create the "building blocks" that form this scene. The sky and clouds are of course still missing and I'll also improve the terrain/cityscape. I also had to replace the actual skybox model with another one since the vanilla skybox has angled sides that ruin the skybox look for these textures. I'll probably just keep this new model for the final release, but I don't know yet. Apart from that I've finalized the Telos Plateau terrain (for now) and I've been working on updating the Dantooine terrain. That includes better placed background mountains and more importantly those "cliffs" you see in the game. I'll post a screenshot of that later. What about the horrendous ground on Telos Polar Region visible in Widescreen- how are you approaching fixing that? Are you talking about the foreground plateau that you walk on? If so, then not at all. This mod is about skyboxes and not a module reskin. No the bottom of the skybox that you can see when the camera does a flyby. 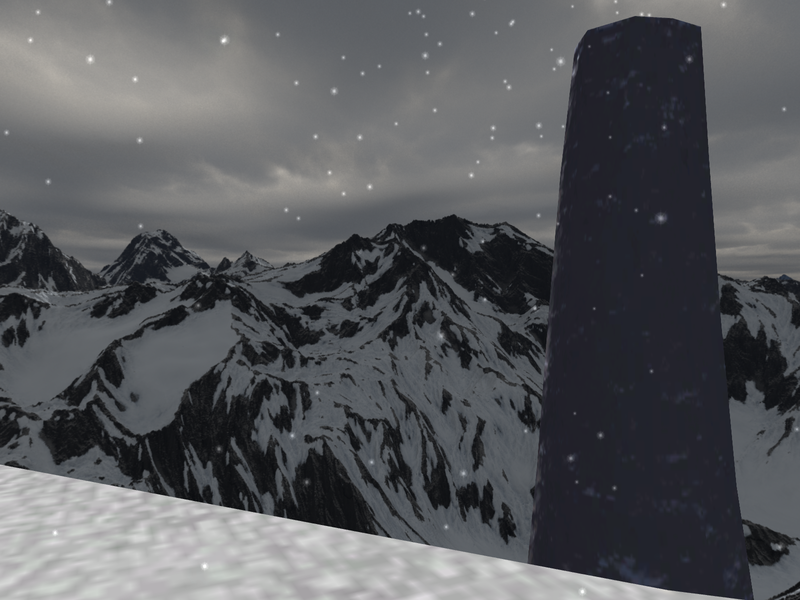 Here, on the right you can see where one of the pillars meet the skybox. And on 1080 Monitors with widescreen it's even worse. Ah okay, now I know what you're talking about. Still, the answer is most likely: Nothing. This is a fix more suited to TSLRCM or a general widescreen fix pack as it's not really related to the skybox. If I were to fix it (which is, as I said, unlikely) I'd just extend the pillars downwards and that's it. Please do extend the pillars, or at least get HassatHunter or somebody to fix this and the fact the shuttle cutscenes have Atton cut in half. These are things that badly need fixing and I don't have the know-how to do it myself. There's a request section here in the forum. Or you could just learn how to do it yourself. That's what I did when I first started modding: I decided something needs fixing, so I fixed it. That's way faster than asking others to do so as most of us have their own projects. It wasn't a problem that existed before TSLRCM tho- that's why a TSLRCM developer should fix it. Atton that is. The Pillars I could learn how to do, but I won't. I think it looks pretty good, there's only one problem: It took 6:40 hours to render and that's at half the resolution I need for a single skybox texture. So at this point I'm looking at 65 hours of rendering for Coruscant alone... which is quite a lot especially since I can't really use my computer while doing so with it having a CPU usage of 100%. The reason for this long render time compared to what I did before are the clouds. I used TG4's EasyClouds for this one and they're really awesome. Unlike the standard clouds, you just add them and they look great. Of course you have to tweak their density, coverage and such but the shapes are great right from the beginning. But as I learned now, this also comes at the price of very large render times. I'm not sure what I'm going to do here. Maybe I'll try and get good standard clouds or I'll just go with the EasyClouds and live with the render time / try to improve it. Also, this may all not seem important as it's only for Coruscant which you see for about 5 minutes in the game, but if possible I'd really like to use those EasyClouds for other skyboxes as well. To be fair, their render times will most likely be shorter as this one has quite dense clouds and a low sun angle, resulting in a lot of noise in the clouds, requiring me to use high anti-aliasing settings which also increase render time quite substantially. So it won't be that bad for the usual "day" shots of other skyboxes (I hope). Does whatever you are using (Terragen, was it?) allow for distributed rendering? I think so, but I've no idea how as I've never looked into it. Well, I think it looks nice so I would favor of the higher quality option. If it's just a matter of processing power, there must be some options here. I wouldn't even mind rendering it for you if there was a way to do that.